Football Manager 2018 features four new hipster-friendly player roles, but how much do you know about them? Here’s our handy guide to learning your Carrileros from your Mezzalas. What does a Segundo Volante do? Segundo Volante might sound like a hitman played by Benicio Del Toro in a dodgy action movie, but in FM18 it’s a useful midfield role named after the Argentine footballer, Carlos Volante. For the uneducated, Volante was a midfielder who lined up for San Lorenzo, Napoli, Torino and Flamengo between the 1920s and 1940s. It’s probably the most unique and unusual of the new roles introduced this year. It’s pretty much an attacking role for a defensive midfielder, so versatility is key to excelling in the position. When identifying a Segundo Volante for your chosen team, ideally you need a player that can; a) tackle and intercept b) initiate attacking moves through passing c) drive forward into space d) physically dominate opponents. 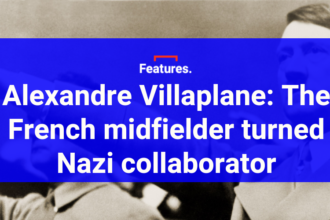 The Segundo Volante is a position for a complete midfield player with an all-encompassing skill-set across mental, physical and technical attributes and, consequently, can be hard to come across. Leander Dendoncker: My very own Segundo Volante. If you do manage to find a player perfect for the role, it can be a real bonus. 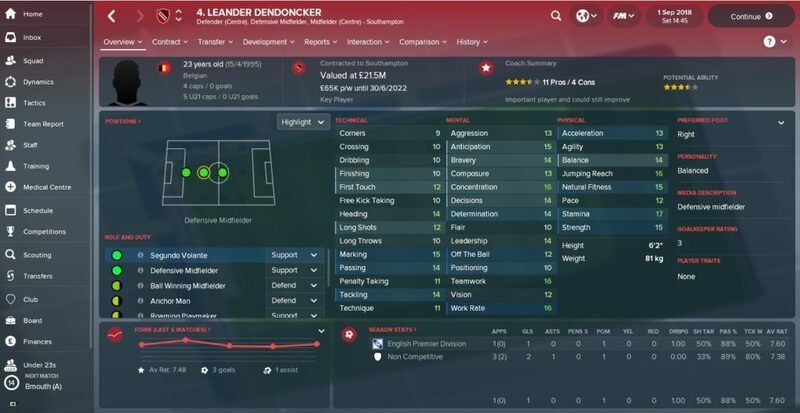 For research purposes I stuck my new signing Leander Dendoncker there for Southampton and he only went and scored the winner on his debut against Manchester City. Honest. How does it differ to other roles? The Segundo Volante is pretty much several roles combined. Similarly to a deep-lying playmaker, a Segundo Volante has to retain possession and move the ball up the field; as with a ball-winning midfielder, they have to put their foot in; and the same as a box-to-box midfielder, they’re expected to arrive late in the opposition’s penalty area. The playing style reminds me a bit of Patrick Vieira and Roy Keane, players who were associated with being defensive midfielders but actually offered a whole lot more going forward. Playing a Segundo Volante as your only defensive midfielder is tantamount to Football Manager suicide, though. To get the best out of them, pair them up with an anchor man or ball-winning midfielder. What does a Carrilero actually do? The Carrilero essentially acts as the footballing equivalent of a crab, shuffling from one side of the pitch to the other and rarely moving too far forwards or backwards. Their main role is to link the play laterally, receiving the ball in central areas of the pitches and shifting out wide to full-backs, wing-backs or attackers. Usually you’ll find a Carrilero (or even two of them) in a 4-3-1-2 or a 4-4-2 diamond shape, where they will act as go-betweens for a defensive midfielder and an attacking playmaker. How a Carrilero is defined on FM18. In narrow formations such as the two mentioned above, the Carrileros have an important role defensively too, as they have to cover for full-backs when they push forward. In contrast to the Mezzala, the Carrilero isn’t a particularly glamorous role. They’ve got to be hard-working, tactically astute team players with Duracell Bunny reserves of energy. Quite a lot, actually. In essence, they have similar duties to perform with box-to-box midfielders in that they are predominantly tasked with linking defence to attack. However, while a box-to-box midfielder is expected to do so with forward movement and passing, the Carrilero instead seeks to funnel the play out to the wings. It’s very much a specialist position as it only really works in a handful of systems and, ideally, in teams that possess outstanding full-backs. What does a Mezzala actually do? 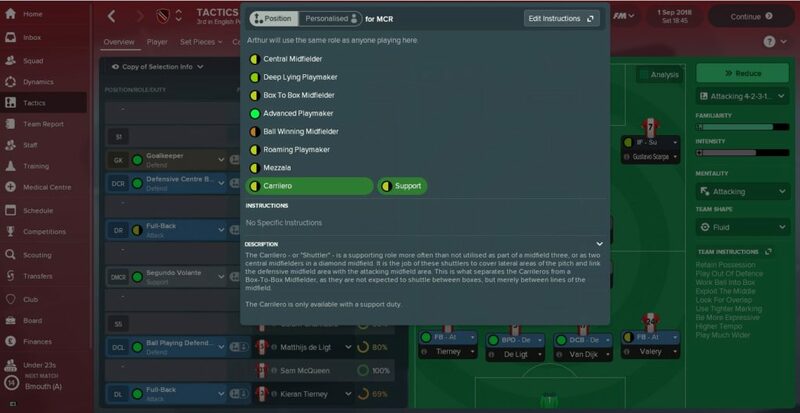 In my Southampton save, I tried to force two tactical systems on my impressionable young squad – a default 4-3-3 using inside forwards and a backup 3-5-2. While the two systems differed a fair bit from each other, there were similarities between each, such as using the full-backs (or wing-backs) to provide most of the width and using a Mezzala. This meant that one of my three central midfield players was tasked with operating in the half-space and filling gaps out wide in the opponent’s half. I had Mario Lemina playing there in a support role at the start and, while he did okay, his form was patchy. After adjusting him to an attacking role, though, he transformed into a Steven Gerrard-esque, all-action midfield general, bursting forward and scoring long-range screamers. It was wonderful. 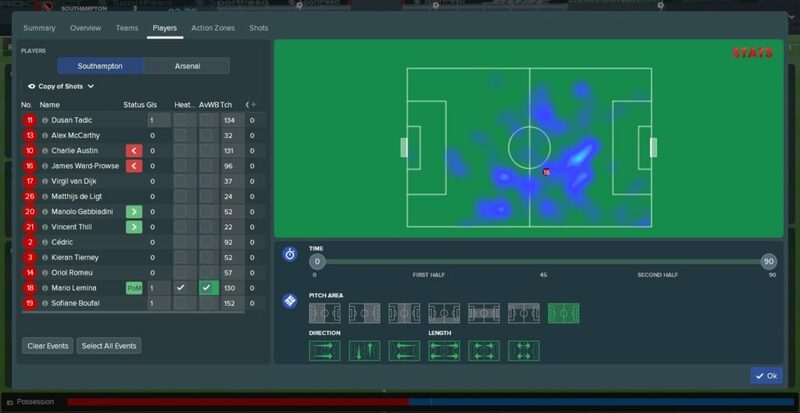 A performance for the ages: Lemina’s heat map from a Mezzala position against Arsenal (he scored and got MOM in a 3-0 win FYI). Of the three new central midfield roles, the Mezzala is the most attacking. It suits athletic midfield players who have the technique and intelligence to make an impact in the final third and works best in a three-man central midfield. The other midfield role most similar to a Mezzala is the Roaming Playmaker as the player in question has license to break forward and impact on the play. However, it is slightly more disciplined as it restricts the areas of the pitch in which they can operate in while there is also a responsibility to rein in the attacking instincts if your team is coming under pressure. What does an Inverted Winger actually do? Comfortably the least exotic sounding of the new roles, the inverted winger isn’t too disimilair to the inside forward. The fundamentals are the same. A left-footed player will occupy a position on the right flank and a right-footer will play off the left. 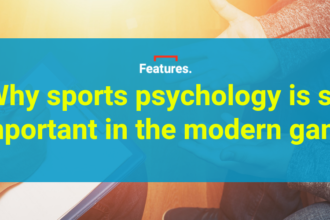 It’s a tactic that has become increasingly commonplace in football over the past decade or so with players like Gareth Bale and Arjen Robben on the right and Eden Hazard and Alexis Sanchez on the left. However, the key difference between an Inverted Winger and an Inside Forward is that the player is a member of the supporting cast rather than the star. Whereas an inside forward is expected to roam in-field to cross or shoot, the inverted winger will instead look to drift infield to free up space for an overlapping full-back out wide. 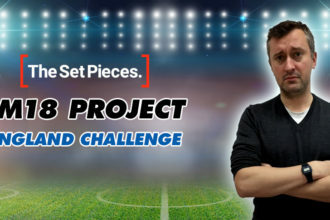 Next articleFM18 Project: What kind of Football Manager are you?